Turns out it was part of an experiment to test the strength of North Sea currents. The experiment originated in - wait for it - 1904. 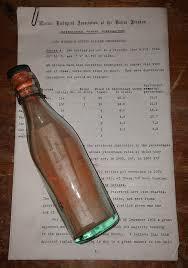 So the bottle has been floating around for over a century! Amazingly, the Marine Biological Association still exists, and they were staggered when they received the information. They duly sent Mrs Winkler the shilling. Whether it was a real shilling or 5p in today's money wasn't revealed.